buildOn’s Service Learning Programs expanded to Boston in 2014, empowering students at schools in the Dorchester community to serve their neighborhood. Many in the community face poverty, food insecurity and homelessness, and Dorchester’s crime rate is 30% higher than the national average. Boston’s buildOn students serve at local food pantries and homeless shelters, serve children with disabilities at Our Space Our Place, and assist people receiving treatment for substance abuse at Boston Rescue Mission. 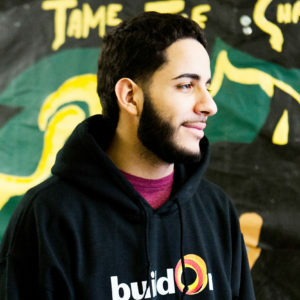 buildOn students are transforming Boston through service. buildOn Boston students serving people experiencing hunger and homelessness, like the vets at the New England Center for Homeless Veterans. Boston buildOn students are tutoring younger children and serving as positive role models in their communities. buildOn students are serving people with disabilities in Boston, like the visually impaired youth at Our Space Our Place. buildOn students are taking to the streets of Boston to deliver meals and care packages to their neighbors experiencing homelessness. Meet some of the Boston students we're empowering to serve. buildOn provides a variety fully immersive experiences that allow your organization to mentor and serve with Boston youth, share your skills, and make a positive impact in your community. Your donation can help a Boston student become a leader in his urban community. A gift of just $36 provides a Boston student with a week of impactful buildOn Service Learning Programs.